We’ve got a special post on green screen and how to do it correctly today. A lot of people ask what exactly is green screen and how do you do it effectively. Follow this guide to learn how and much more. Green screening has become one of the most effective ways to create scenes that were unimaginable in the not-so-distant past. Your limit is your imagination! But beware, there are common mistakes. The good news is that, if you follow this guide, they can be avoided. This guide is meant to give you the tools and know-how necessary to create fantastic and realistic effects using the magic of the green screen. 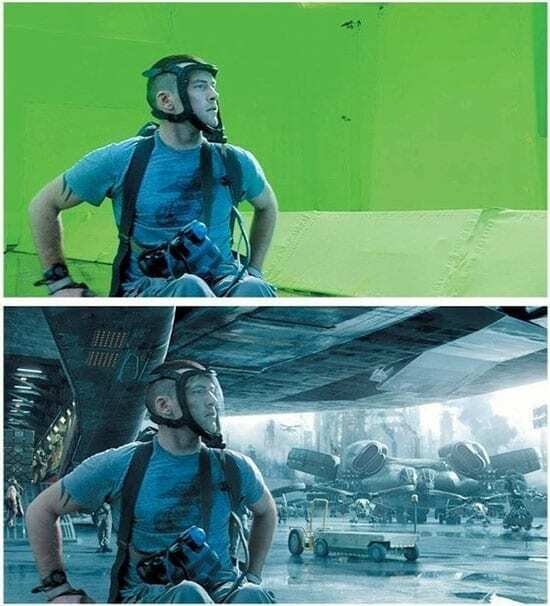 We may not all have James Cameron’s budget, but the basics of his chroma key techniques remain true no matter where you are on your filmmaking journey. 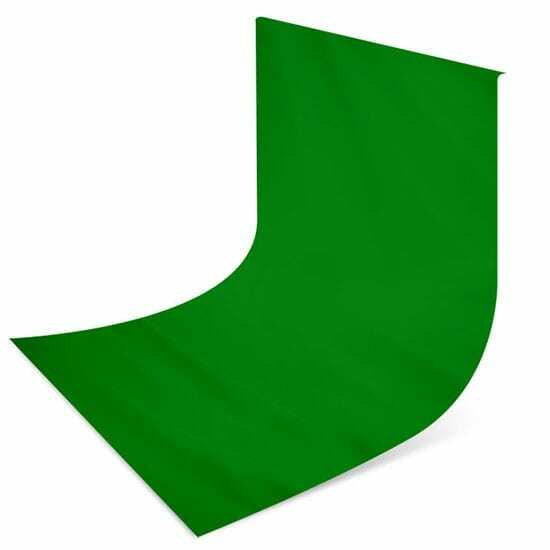 Green screening, often referred to as chroma keying, is the ability in post-production to key (or adjust) the chroma (colors) that are visible in the layer of any shot. For example, if you make the color green invisible in one layer, then the footage in the layer below that clip becomes visible. This is the essence of green screening. The most common colors used are bright green (“green screen”) and bright blue (“blue screen”). The main goal here is to create as much color difference between the backdrop and the actors as possible. The importance of this distinction between foreground and background will come up time and again, as most of this guide consists of techniques intended to achieve that end goal. Why green or blue? These are the most common because bright green and blue are the best for creating contrast against your actors skin, hair, and clothing. Green is the most commonly used, can you guess one reason why? Hint: ask yourself if you will be chroma keying a closeup on a blonde-haired, blue-eyed beauty in your film. Why is chroma keying valuable? For new filmmakers, this technique can take your actors beyond the limitations of your set, your city, and even your universe. It can take them to a tropical paradise or the depths of outer space. I have separated this guide loosely based on roles in a film crew. Maybe you do have a gaffer, lead grip, cinematographer, director, actors, yada, yada, yada; maybe you are a film crew of one. The organization here should help categorize this guide no matter your crew size. I’ve separated it by guides (1) for the set, (2) for the actors, and (3) for post-production. Does everyone remember our main goal?! That’s right: create as much color difference between the backdrop and the actors as possible. The keys to creating a backdrop are the color selection and creating as smooth a surface as possible. Angles and shadows are your enemy, because they create colors in the background that come closer and closer to those found on your actors. There are a few options for your backdrop. You can (1) use green screen paint, (2) use a large green sheet, or (3) build your own wall and paint it. Have a relatively static shot (camera position and angle won’t change too much). There is no camera angle farther out than a medium-shot. Intend on staying in the same location (remember paint is somewhat permanent). If you have the time, the money, the tools, and some woodworking talent you can also build your own setup and then paint the entire thing. I won’t go into detail but if that interests you here is a link to a YouTube video. – Wrinkles create shadows and shadows create post-production difficulty. Solution: what else do you do with wrinkles? Ask your mom to iron your sheet (kidding. Give your mom a break for once…). – If the sheet falls to the floor and then turns abruptly you will have the same problem as if you just paint the wall and the ground green: the bottom edge. Solution: buy a long enough sheet that you can pull out the bottom edge to create a smooth curved surface from ground to wall. – Too much green on the set will reflect green onto your actors, blurring the distinction between actor and backdrop. This is called “green spill” and it makes post-production frustrating at best, impossible at worst. Solution: use the least amount necessary to safely achieve your final vision and follow the guidelines for effective lighting (below). If you already have an entirely green room, consider using black sheets to cover up any green that is not necessary in the shot. Time and again when researching or talking about chroma keying, you will hear the same thing: it’s all about the lighting. Because there is a range of types of lighting you might have accessible in your studio (check lighting equipment here), I will go through the keys to success and how you might achieve them with the equipment available on this site. It is critical to light the backdrop in such a way that— as much as possible — it creates even color and eliminates shadows. There should be enough separation between the actor and backdrop to ensure that no shadows from the actor are cast on the backdrop. The goal is to reduce shadows from things like wrinkles and uneven draping (unless you build your own screen it will probably not be perfectly flat no matter how much ironing you do). The lighting of the subject brings in a new creative challenge. Of course, as always, our goal is to create distinction against the green screen. Now, however, is where our end-vision really comes into play. Your actor will stay in the shot after the backdrop has been chroma keyed out (if all goes according to plan), so where are you putting your actor? The lighting on the actor must work with the scene they end up in after post-production. Your key light is the one creating the most significant effect on your actor. 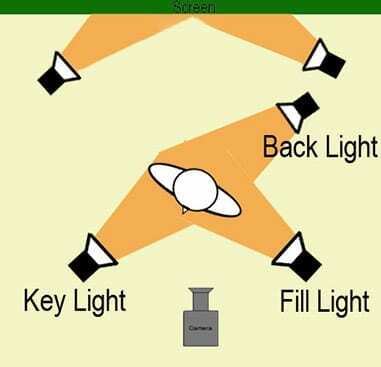 Think of it this way: your key light represents the direction of the sun. The fill light is softer and placed at an opposing angle, to ensure the shadows are not too extreme from the main light (i.e. to fill in the shadows caused by the main). Think of it this way: you don’t want your actor looking like they’re under an interrogation lamp when they’re supposed to be outside at noon. The back light is especially important for green screening, beyond being part of any solid lighting setup. Why? The back light will illuminate the edges of the actor and create clean line at the transition between actor and backdrop. Once again, this will make post-production easier by distinguishing in the fewest number of pixels the difference between these two. Recreate direction, angle, and composition of the lighting of your final scene. Direction and angle are simple, you just need to review the shot you will be replacing the background with and identify where the light is coming from. Imagine where the light must be to create the shadows in that shot. You also need to consider the composition of the light in your resulting scene. Are they outside or inside? Is it dusk or early morning? Are they supposed to be under a street light? Reflectors and gels can be used to create a variety of these effects. Here it is again. As I mentioned, green spill can become the bane of your existence if not caught and addressed early enough in production. Imagine doing the entire setup, hirings actors, and capturing hours of footage only to get to your computer and realize you are left with the options of (1) removing your actor’s hair or (2) having her haloed by a bright green border. Continue to adjust your key, fill, and back lights until you can see as little green reflection on any part of your actor as possible (don’t forget to check the props, too). Once again, it is critical to keep a vision of your entire shot while putting together your set and your lighting. Seeing the theme yet? This item isn’t so much of a guide/bullet list as it is a place for you to pause, consider your shot, and — if you have the time and budget — to test what you’ve done so far. Is the backdrop big enough such that there is no camera angle where it is cut off? Does the backdrop keep an even and consistent color for every camera angle? Does a significant shadow from the actor hit the backdrop from any of her positions? Is the lighting on the actor realistic for the entire shot? Hint: when I’m outside and walk six feet left, the sunlight is still coming from the same direction, right? Are you exhausted yet? If you are, stand up and move around for a few minutes. Chug some water! But celebrate because in all honesty, we’ve just covered the overwhelming meat of the guide to successful green screening. The setup is most of the work. Actors’ performances are critical for any great film, but with a green screen we are once again presented with an interesting and fun creative challenge. A lot of the time on stage and on film, actors are afforded the luxury of being given a set, props, and other actors that allow the imagination to enter the role more easily. This sounds self-evident, but I put it here because it is especially important that the actor really shares the director’s end-vision of the scene because you will be navigating in, interacting with, or reacting to something that will not physically exist around you on the set. If possible, give the actors real-time feedback. You can set monitors up and utilize a “live chroma keying” software to actually provide real-time feedback to the actors. For example, have you ever seen a weatherman point to the wrong place on their weather map, look at something off-camera, and then adjust where they’re pointing? They are looking at live feedback on a monitor. You may need something that you expect to stay in the final scene. Again, this might be self-evident, but if you expect your actor to be picking up a phone from a desk then I hope you will have a desk on set and… you guessed it. A phone on that desk. Green props/placeholders also help the actor. Say you want your main character to get into an argument with an NBA All Star, a helpful tool would be to create a green, seven-foot-tall, human-shaped object for them to “act with”. This helps them by providing a real focal point (they probably should be looking up for it to be realistic, right?). If they are expected to navigate something on set, it better be set up for them to navigate. For example if they are expected to be climbing an elaborate and fantastical stairway to heaven, you should have a green stairway on set for them to walk up. You may have to get creative with your lighting to ensure this part of the set also has even color and minimal shadows. You’ve built your set, set up your lighting, tested your shot, prepped your actors, filmed your scenes, and are ready to create some magic at your computer. While this might at first seem like it would be the most intensive part of the journey, it is not! There is a variety of other software available for livestream chroma keying as well, if you expect to be broadcasting live or streaming from your computer. Note: this software is valuable if you intend to provide real-time feedback to your actors. Remember also that there is a wide array of post-production effects that are at your fingertips that would otherwise not be possible without the green screen. Because the entire layer is now only your actor, you can play with this layer to create different results. You can make them fly away, you can make them GIANT or tiny, in fact you can make them groW or SHrink. Have fun with it. Green screens can liberate the filmmaker from the limitations of their set (and universe for that matter). When done well, these can create the effect of a high-budget blockbuster while still on the modest budget of an up-and-coming filmmaker. Create even lighting across the backdrop, illuminate your actors realistically, and avoid green spill at all costs. This will ensure you keep everything in mind during the critical initial set-up of backdrop, lighting, camera position, and props. 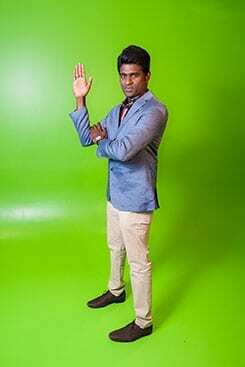 Having the equipment and technique to effectively chroma key opens worlds of possibilities (yes, worlds — plural). 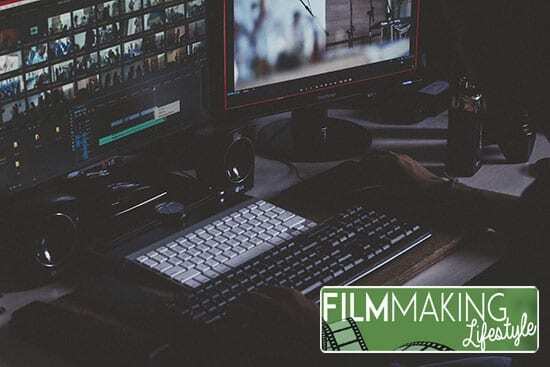 Let your imagination and creativity flow as you add this ability to your filmmaking repertoire. Please send in questions and comments. I highly value all feedback (whether you found the article useful or you hated it) as it helps me hone my craft along my own creative journey! Awesome article! Great, great content and I love the detail of what youve covered here. Got a question though. Is greenscreen viable for those just starting out? Is it something a newbie video production company could do or is it just the realms of the big studios? While there are certainly things a big budget can do with a green screen that a newbie cannot, the principles are the same so there’s no reason you can’t use the technique when you’re just starting out if its what you need for your vision. What a newer company maybe won’t have is major CGI graphics teams and insane helicopter shots over New Zealand, etc. etc. that fill backgrounds in Avatar and Lord of the Rings, but the cool thing it that if you can’t film the backdrop you want, there is a lot of content online to borrow from (just make sure you check the rights!). Point is with the tricks above, a green background, decent lighting, a camera, and a basic editing software you can absolutely do this like a pro. Thanks a lot for this awesome post, you have use your time to touch almost every area needed to be touched. Appreciate it, N’Sha. Cheers for the comment. My sister works in a production house and they need to use chroma key flooring. It was explained here that chroma keying is used for post-production. Moreover, it’s recommended to go to trusted businesses when considering chroma key flooring creation. Thanks a lot for the contribution, Gillian.